Hello calf muscles! Not only were they cramping during the Falmouth Road Race but also they continued to cramp and be sore until about Thursday morning. Ouch! With that being said, not a whole lot of running this week. Good week, bad week, repeat. Saturday was the Insane Inflatable 5k at the Barnstable County Fairgrounds! 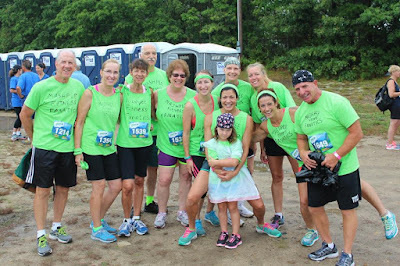 My group training group from Mashpee Fitness put together a team and we had a blast! It was POURING all night/morning but it stopped just as we got there—that left the inflatables full of water and the course super muddy. FUN! (Anyone that knows me well is aware that I don’t like getting dirty.) I mostly walked from obstacle to obstacle with some of the group but we all finished together. The finish line is a big slide! So cool! Georgie Run Updates: The pup ran run her longest to date! 1.98 miles. She couldn’t make it that final 0.02 but that’s ok. We will try again next time. One thing I’m struggling with is finding routes to take her. She won’t let us repeat loops and if we get too far from home she plops down in the middle of the road refusing to go any further. Diva pup. "But mom, home is that way..."
Houston Updates: Flights have been booked and I’m working on my 16-week training plan. I’m anxious to get started! 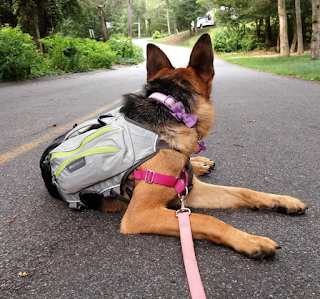 · 9 weeks until the Cape Cod Half! · 21 weeks until the Houston Marathon!